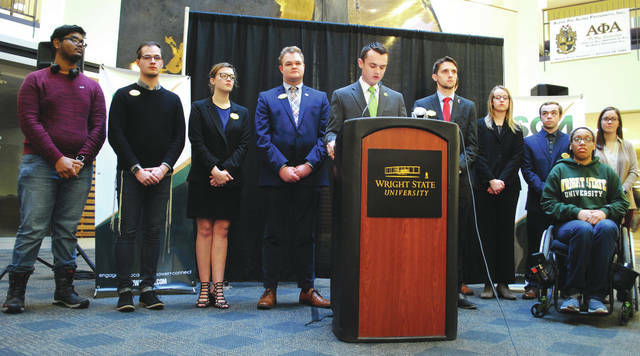 FAIRBORN — The Wright State University Student Government Association called on the school’s administration and faculty members belonging to the American Association of University Professors to come together for a sit-down meeting Jan. 24 for the sake of the students. The two sides have been unable for more than two years to agree upon a new contract terms for faculty members, sparking a strike and picket line to be formed by the AAUP-Wright State Chapter Jan. 22 after members rejected the Wright State University Board of Trustees unilaterally adopted “last, best offer” earlier this month. The SGA highlighted, during a press conference held Jan. 23, that 40 percent of the approximately 560 AAUP-WSU members have crossed the picket line, while 60 percent remain on strike, which Daniel Palmer, SGA president, said is detrimental to the students education. The meeting was proposed for 12 p.m. Thursday, Jan. 24 between both sides. Palmer said Wright State President Cheryl Shrader called him to agree to the meeting, while the AAUP-WSU responded via email saying they would not be able to attend the meeting as a federal mediator has been assigned. He added that the SGA was not aiming to serve as a mediator to remedy the situation, but rather wished for both parties to hear student concerns for the sake of getting the teachers back into their classrooms. Students attending the full current semester at Wright State have until 5 p.m. Friday, Jan. 25 to drop/withdraw from their classes and receive a 100 percent tuition refund. Palmer said that while students have this option, Wright State is a “great institution” and that shouldn’t be foreshadowed by the strike.